Gerrit Vyn is a sound recordist for the Cornell Lab of Ornithology. 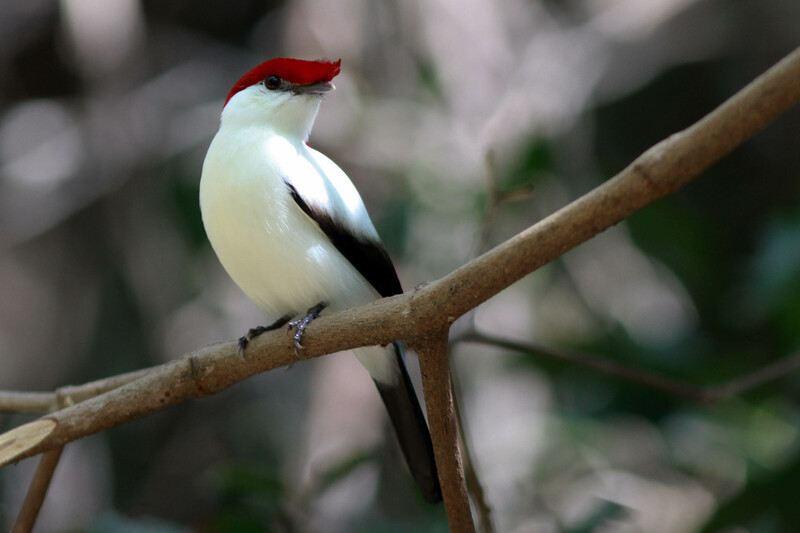 He recently traveled to northeastern Brazil’s Araripe Plateau in search of the Araripe Manakin, a beautiful white bird with dark wing-tips and tail-feathers — and a deep red hood. The Araripe Manakin is critically endangered, in part because of its limited range. But, as Gerrit observes, human activity also threatens the bird’s survival. So literally I can see the entire species’ range from a hilltop here. It’s along the slopes and usually associated with springs. There’s a lot of natural springs here, and it supports the vegetation they like and the foods they like and the females like to nest, literally with their nests hanging over these small creeks in the tropical vegetation. Besides it being such a limited range, there’s also a very high demand for this water so a lot of the springs have been degraded, and a lot of them have most of their water extracted from them. So protecting these last springs that support these birds is critical for their survival. Which is partly why recording the Araripe Manakin is such a big deal. Tomorrow we head into the woods with Gerrit Vyn of the Cornell Lab of Ornithology to capture one of the first clean recordings of this critically endangered bird. Field recordings by Gerrit Vyn. Editing and mixing by John Kessler and Dominic Black.